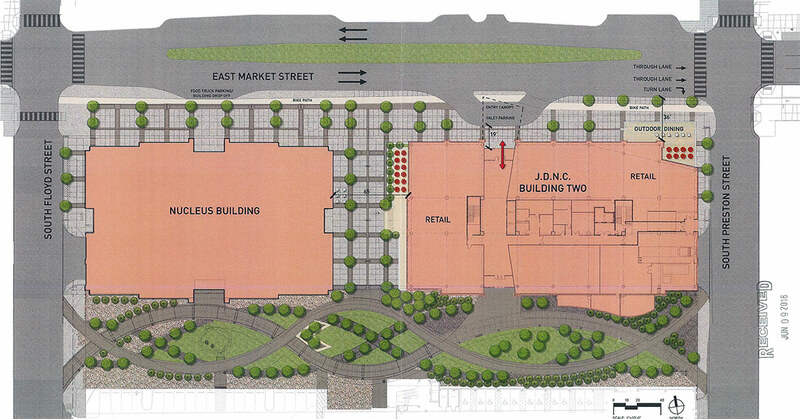 Tomorrow, Wednesday, July 20, the Downtown Development Review Overlay (DDRO) Committee will examine a proposal for a new mixed-use office building proposed for the corner of Market Street and Preston Street on the Nucleus block—sorry, the JD Nichols Campus for Innovation & Entrepreneurship block. We previously looked at the structure’s design, by Cincinnati-based BHDP Architecture, over here. 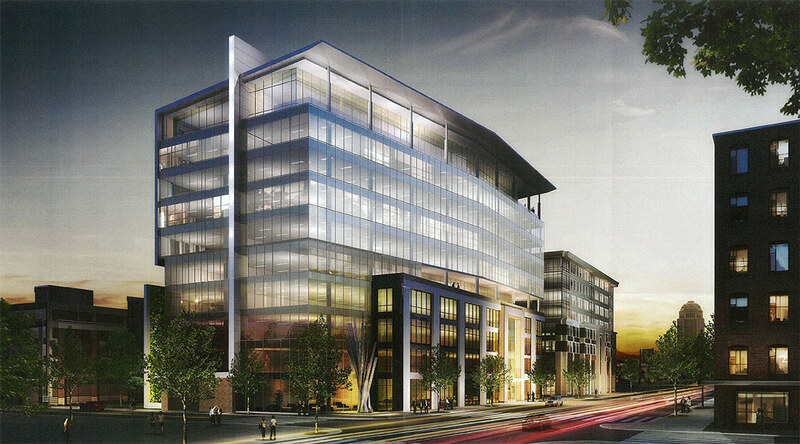 The quite good-looking design from the University of Louisville Foundation and NTS Development, so far named rather anonymously Nucleus Building 2, calls for over 325,000 square feet of space including two ground level retail spots and a rooftop restaurant on the 11th floor. There’s a lot we like about this structure and we think the committee will, too. First of all, it’s important to note that the reconfigured East Market Street shown here is part of the current Market Street Master Plan concept that will reshape the entire corridor—except for one small part. The overall streetscape—including that central median—won’t be evaluated by the DDRO committee and we’ll look more closely at the entire stretch later. Building 2 does make one significant urban design gesture, though: a driveway-slash-parking lot. It erodes the improvements of the master plan so far as to make them useless or even dangerous. The driveway is so bad because the rest of the design is so good. And it’s a superfluous amenity that promotes driving Downtown. It’s not needed and should be removed. Let’s examine at the whole block first. Looking at the 300 block’s overall site plan, you can see a lot is proposed on the street alone. This is one of those blocks of Market that widens out might have once had either a building or a park in the middle. A slender landscaped median is marked in the center of the street and wide, tree-lined sidewalks in front of the Nucleus buildings are shown. Zooming in, you can see a light beige stripe running roughly parallel the street. That’s a bike lane. Not just any bike lane, either—a quite fancy curb-separated protected bike lane. That would be a first for Louisville. 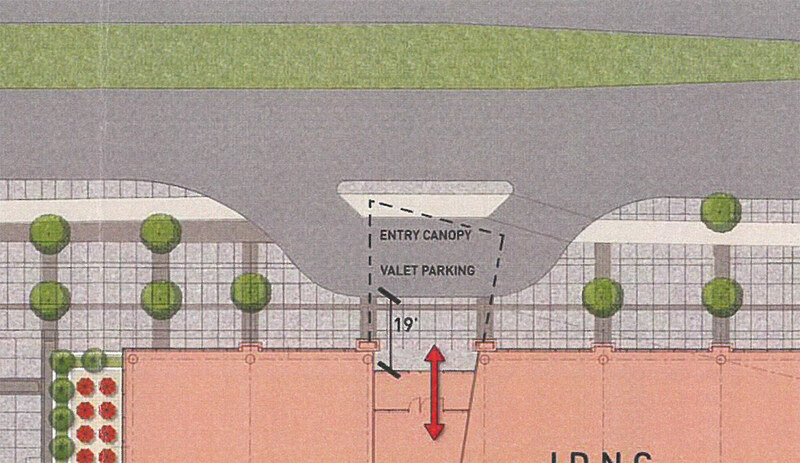 You can also see that the two-lane driveway takes away two-thirds of the sidewalk and serves the sole use of valet parking. What’s also clear is that the driveway will make the bike lane more dangerous and generally useless. The wide curb radius will allow motorists to turn into the drive at rapid speeds, putting them in direct conflict with cyclists. And as anyone who has seen such a large valet stand knows, cars will very often be parked blocking the bike lane. The point of the two lanes is to have one be parking, after all. 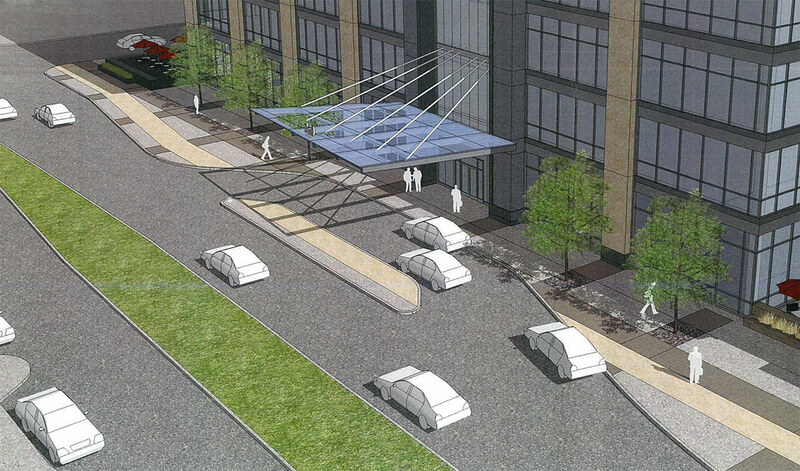 It’s even shown that way in the renderings, with a parked car blocking the bike lane. The driveway is essentially a pull-up parking lot. As an alternative, Building 2 could easily add a dedicated drop-off / valet area on the parallel parking lane, even cutting into the sidewalk a single lane as a similar dedicated food truck spot does to the west. Such a change could also add six large trees wiped out by the drive. The driveway is just too destructive to the urban fabric of Downtown Louisville. It erodes the sidewalk, promotes driving, makes cycling dangerous, removes street trees, and isn’t even needed. If you’d like to attend the DDRO committee meeting on the 350 East Market Street structure (16DDRO1011), head on over to the Old Jail Auditorium, 514 West Liberty Street, Wednesday at 8:30a.m. It’s the only project on the agenda, so the excitement should pick up pretty quick. We urge the committee to praise the building’s architecture, but question its urban design. There’s no need for more parking lots and driveways in Downtown Louisville. It’s such an unnecessary move. But seeing how the city just rolls over for any development downtown, I’m not holding my breath on this getting shot down. Do they make an immediate determination, or will we have to wait for their recommendation. If it is denied, are their other avenues for them to go through to try and get this into the development? Thanks again for fighting the good fight on this. I’m curious why a building targeted ostensibly for research but likely to be occupied by business offices thinks it needs a valet parking amenity at all. Are they thinking they will attract a hotel or something? All those fat cat multimillionaire researchers that actually don’t exist (yet are surprisingly common straw men)?